Stephen Hawking once proclaimed that String Theory may be able to unify the various forces although later he became disillusioned thinking that there may be no Theory of Everything. This very condensed book pulls together the various forces into the Spirilla Theory which supersedes String Theory and introduces the Relativity of Consciousness. The foundation of the Spirilla Theory is based on the writings of H. P. Blavatsky, A. B. Bailey, and A. Besant. By overlaying the works of Einstein, Bohm, de Broglie, Dirac, Bell and other great scientific minds, on top of the foundation, the unification of the various forces and theories starts to appear; each field of study supplying a part of the puzzle but only a holistic view of ALL endeavors will solve the mystery. The book starts by laying the groundwork through the Introduction, a review of Bell’s Theorem and p-adic mathematics; following this, each major section begins with a quote from the foundational works followed by the quotes from scientific papers demonstrating the current known thinking on the various topics; no attempts are made to edit the works (except with a few exceptions for clarity and/or length) of the various authors and references to the scientists’ works are maintained. Each section is pulled together so that a picture can be seen. Gives detailed information for the development of a new energy source – Quantum Energy. the work of form-building, transmutation of form and the building of a human form. death including the processes of death, two main reasons for cremation and the sequence of events at death. The ‘Pictorial Compendium of The Secret Doctrine, Volume IV, the Nature of Everything’ is a compendium on various topics including the Origin of the Universe and solves the mystery of expansion, to Evolution (sorry Darwin but you are wrong!) to discussing ‘Initiation, Initiates and Masters.’ Pictures are used to for the young, the young at heart and non-scientist, and words, at times, for the highly educated. 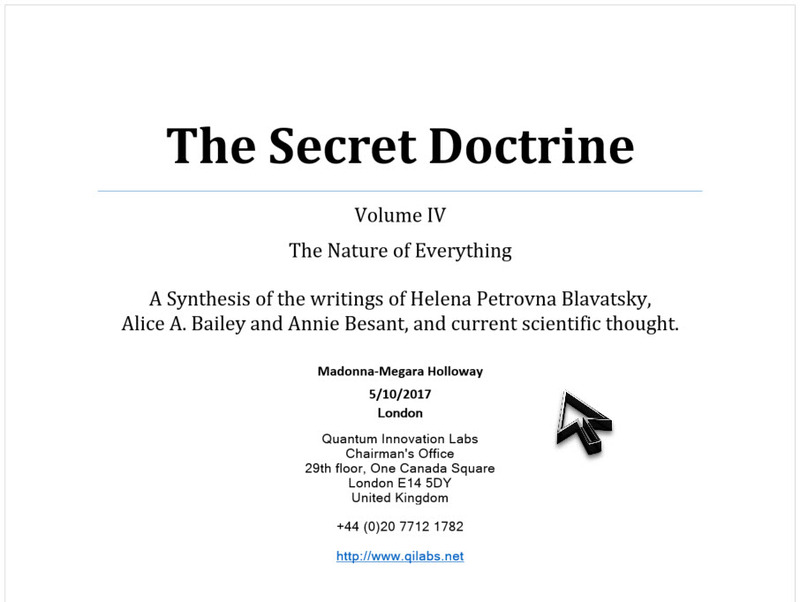 It is meant to bridge the gap of Part II Ontology, Epistemology & Manifestation of NOE hence the discussion around physics and chemistry is limited since these topics are covered in The Secret Doctrine, Volume IV. Extracts of the Compendium may be found under the Collections tab, The Nature of Everything, Collection.